KADATEC ltd. is a manufacturer of small and large propane storage tanks, autogas filling skids and road tankers. We manufacture in the new production plant and on the new machines. Company’s manufacturing, engineering and business activities are focused in the area of liquefied gases, especially LPG. The aim of activities is to promote LPG as an alternative to other energies in households and industry. We started our business activity in 2006 as sales and developing company in the field of LPG, gradually growing our offer in LPG technologies. 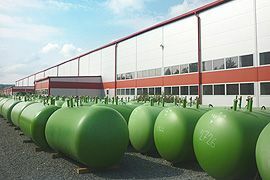 In 2011-2012 we built up a new plant for manufacturing of LPG storage tanks, for production capacity of 12000 tanks per year. Our tanks are manufactured on new and modern machinery. Hereby we achieve production quality and productivity. In order to offer a complete technological solution for LPG applications, we cooperate with world leading manufacturers of LPG technologies. We also pursue our own development activities in cooperation with technical universities. Geographically, we cooperate with companies in Western and Eastern Europe, the former Soviet Union and the USA. Our current offer includes complete technology solutions for domestic, industrial and autogas sectors. At your request, we can prepare technological projects for our products with presentation in 3D. Our products comply with European requirements, and are certified according to European standards ISO, PED and TPED directives, ATEX, and EAC standards. Manufacturing of LPG storage tanks. Design, development, manufacturing, sales of LPG storage tanks, road tankers and filling stations. Development, manufacturing, sales and service of control, measuring equipment and dispensers for LPG/LNG. Development of compact systems of LPG technology in form of modular tanks / containers, vaporizer units. Development and production of accessories for LPG tanks (LPG monitoring system, cathodic protection). Representation of companies Algas-SDI, Corken, SRG, REGO, Gilbarco / Veeder-Root. The company is focused on future in application of energy sources. We see LPG as an alternative source that allows independence from the central distributor (e.g. production of synthetic natural gas, power generation from LPG, etc.) and in the future the autonomy (individual heating, residential cogeneration unit, home-based filling station). Our credo is that everything is already invented and must only be applied properly and in time.